A mentor of mine once stated that the two most important ingredients to a successful business are urgency and accountability. In 2011 I wrote another blog with the same first line… http://www.punchstick.com/watch-out-for-the-wolf-in-sheeps-clothing/ but I am using it again here because I think this is that biggest problem with websites. Once you decide what you want from your website, you should have urgency to get it done. Your web developer will move as fast as you. If you drag things out by being slow to respond to questions from your developer or slow to deliver content, you will one day wake up mad at your web guy because the site is not done. Having urgency and respecting urgency of others is critical not just for meeting a time frame, but it maintains excitement about the project. When your people and the web team are excited about a job it somehow shows in the results. 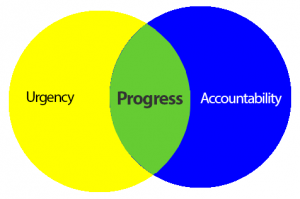 The best way to maintain urgency is accountability. At Chico Web Design we make ourselves accountable with our guaranteed delivery time. “Web sites when we say or you don’t pay” and we hold the client accountable by getting them to commit to their role or they forfeit the onetime guarantee. Urgency and accountability go a long way. Don’t mistake panic as urgency. Panic does not allow you proper time to plan. Failure to properly plan will leave holes in accountability. Panic is the result of lack of planning or failure to execute. Urgency is focus and drive on planning and executing. When you are so excited about a decision to make change in your business that you begin implementing it right away, you have urgency. To have urgency you must have an “urge” to do something. Most people only have an urge to make their life less busy. These are the same people who point fingers and say “it’s not my fault” when something is missed. Accountability is how you force some urgency. Set high expectations and hold your people accountable to them. This will give them urgency to achieve. If it doesn’t, you have the wrong people.